It takes a LOT for me to like a sunscreen. It basically has to move mountains before I'll even consider telling you about it. When I first heard about Supergoop! 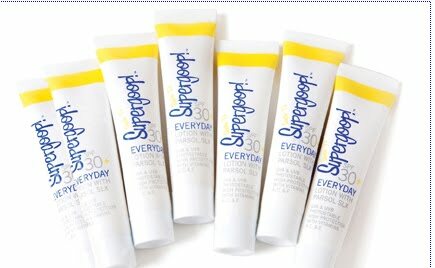 SPF 30+ Everyday UV Face & Body Moisturizing Sun Protection Lotion, I was a bit skeptical. Anything with the word "goop" in the name just has to be utterly thick and messy, right? WRONG. Best of all, it's sweat-and-water-resistant -- so you can swim and run without any fear of it streaking or sliding off your face. Supergoop! SPF 30+ Everyday UV Face & Body Moisturizing Sun Protection Lotion comes in two different varieties. The 1.6 oz. bottle is $14. A set of 17 .33 oz. singles is $38. Sounds like something I'd like to try! But... where do you buy it? I was just introduced to this brand from sephora and LOVE it!! It is my new MUST-HAVE! The lotion is very pleasant to apply and so much more cosmetically elegant than many pricier brands I've tried.